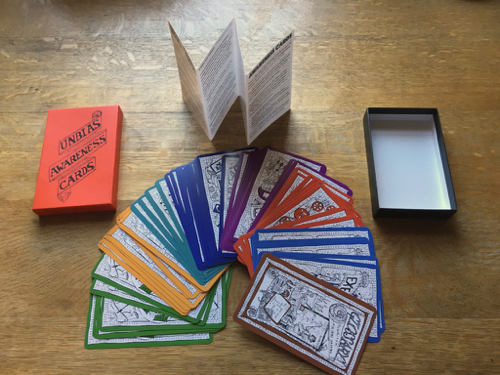 I will be running four workshops with Alex Murdoch exploring the UnBias Fairness Toolkit at the V&A’s Digital Design Weekend on Saturday 22nd and Sunday 23rd September. Each workshop is intended for different audiences and contexts in which the toolkit could be used. Algorithms, bias, trust and fairness: how do you engage young people is understanding and discussing these issues? How do you stimulate critical thinking skills to analyse decision- making in online and automated systems? Explore practical ideas for using the UnBias Fairness Toolkit with young people to frame conversations about how we want our future internet to be fair and free for all. The UnBias project is initiating a “public civic dialogue” on trust, fairness and bias in algorithmic systems. This session is for people in the tech industry, activists, researchers, policymakers and regulators to explore how the Fairness Toolkit can inform them about young people’s and others’ perceptions of these issues, and how it can facilitate their responses as contributions to the dialogue. Celebrate ten years of London Design Festival at the V&A with a special event on Exhibition Road. Bringing together events by the Brompton Design District, Imperial College, the Natural History Museum, the Science Museum and the V&A, this fun-filled day of design, workshops and talks will offer something for everyone, and a unique way into the many marvels of Albertopolis. What is algorithmic bias and how does it affect you? How far do you trust the apps and services you use in your daily life with your data and privacy? How can we judge when an automated decision is fair or not? Take part in group activities exploring these questions using the UnBias Fairness Toolkit to stimulate and inspire your own investigations. How do you feel about fake news, filter bubbles, unfair or discriminatory search results and other types of online bias? How are decisions made online? What types of personal data do you share with online companies and services? Do you trust them? Explore these through a range of activities, from Being the Algorithm to Creating a Data Garden, and from Public Voting to making a TrustScape of how you feel about these issues. Suitable for families.